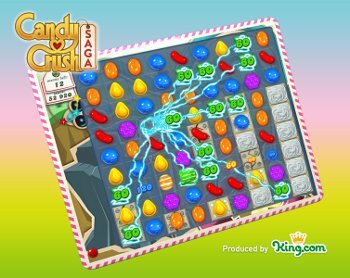 From the people who gave us Bubble Witch Saga, now brings you Candy Crush Saga. CCS is one of those games where you need to slides the tiles in order to made 3 or more in a row for points. There is a fair amount of flashiness and pictures of candy. There are currently 65 levels of game play, no PvP mode (however I don't know how that would be doable...maybe a time challenge) but you can see you score compared to all your friends for every level so thats neat. Levels are beaten when the Game mode challenges are completed. Game modes are as follows. Score Players must reach a minimum score in order to clear level. Wrapper Clear all tiles with candy in a wrapper before you run out of moves. Drop It Get all of the 'Drop It' items to the bottom row before you run out of moves. Time Achieve the objective before time runs out. You can also expect to enjoy; Candy, Jelly Fish, Lollipop Hammers, Coconut Wheels... and Tiffi and Mr. Toffee! In conclusion you can expect a colorfully cutesy puzzle game with Candy Crush Saga. 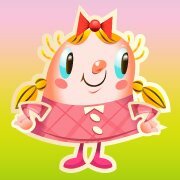 For everyone with a candy fetish, fan of Willy Wonka or simple puzzle enthusiast have some fun with Candy Crush Saga. And to those who enjoyed Bubble Witch Saga and similar games, I think you will enjoy Candy Crush equally.